Family survey forms are documents which are made by organizations and institutions to obtain a statistical report in lieu of a subject related to family matters. 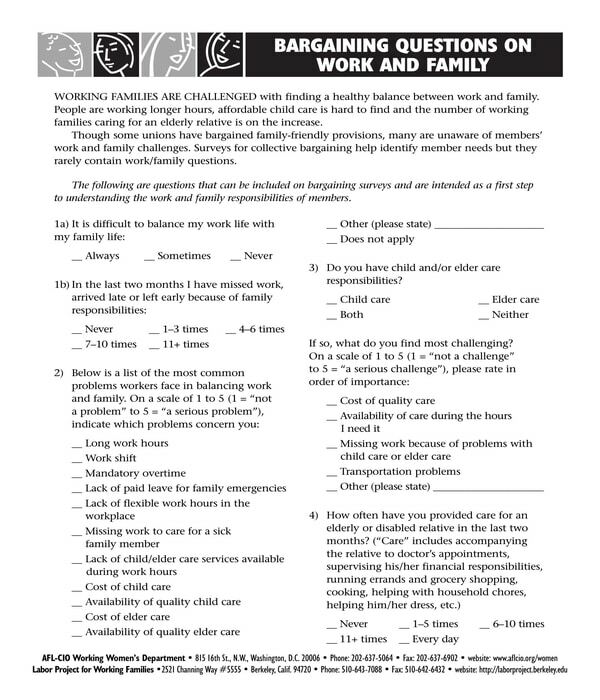 Most family survey forms are used by State agencies, schools, and medical institutions since they are the organizations who have family-related goals such as maintaining the relationship of a child and a parent for the child’s development. Moreover, due to the personal details disclosed in the form, the entries, and the form itself, must be kept confidential by the organization collecting the survey. Document the concerns and needs of the respondent and his family: Survey forms can be a tool for knowing what a respondent needs and what he is expecting. For instance, prescribed medicines that a respondent’s family member will be needing for a medical condition will be disclosed in a family survey form that focuses on determining the number of people in a household who needs medical assistance. On the other hand, a survey form that centers on the financial state of the respondent’s household will allow an organization to acknowledge how many respondents are eligible for a financial aid program, and how many among the respondents can be financial sponsors for those in need. Promote awareness of the subject: A survey must only be done with the sole purpose of obtaining data and numbers about a specific subject or topic. Not only the rating scales and questions to be answered by the respondent should be placed in the form but also a short, yet concise, introduction and summary of why the survey is essential. In addition, where and how the surveyed data will be used by the organization should also be included in the form. Create ideas and plans from the respondents’ answers: By using family survey forms, an organization will be able to communicate with the respondents and to know what the majority is voicing out. This allows the organization to have ideas and make plans for the respondents as well as decide whether or not to continue to a proposed plan based on the obtained survey. 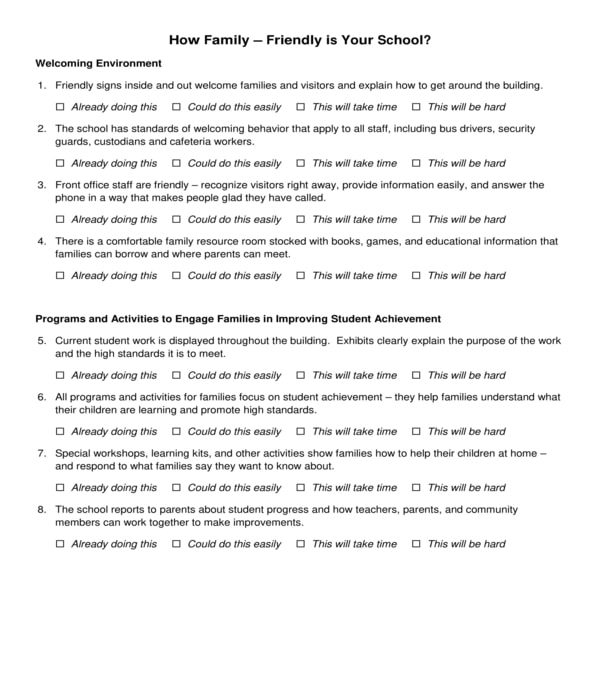 Family Engagement Survey Form – In school, legal guardians and parents are expected to engage with their children who are students of the school, as well as their student’s teachers. To document the engagement of a student’s family with the school staff and members, a family engagement survey form must be provided by the school. The student’s parents will be the target users of this form. The focus of a family engagement survey form is to determine the family-friendly attributes and factors of the school such as whether there are activities conducted for meeting the students’ families and the types of programs intended to engage the students’ parents and the teachers. The suggestions of the respondent for a short term and a long term plan in making the school more family-friendly will also be required to be explained in the form to complete the survey. Family Life Survey Questionnaire Form – Contrary to the term “family life”, this form is only to be filled out by a widow, single, or a divorced woman. The objective of the form is to document the answers and ratings of the respondent with regards to her household life as a single woman, either with children or with her relatives. In addition, the form will also collect a few pieces of personal information from the respondent such as the respondent’s date of birth, work status, and salary information. 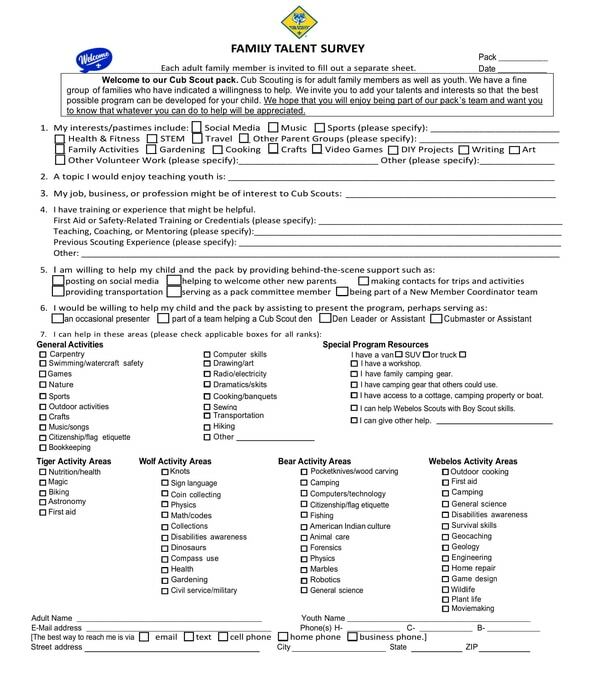 Family Talent Survey Form – This form variety can be a supplemental document to the aforementioned family engagement survey form since it is intended to be completed by a child’s family or the child’s parents. The goal of the organization who uses this form is to identify the talents and skills of a child’s family in order to create a program wherein the family members can participate and be engaged in. The hobbies, work, and academic credentials, as well as the activities that the family member is willing to take part in, are some of the information to be disclosed in the form. 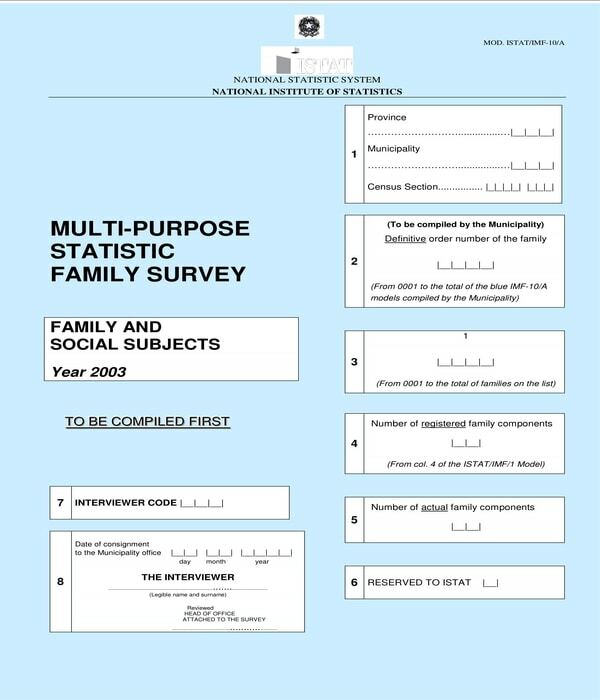 Multi-Purpose Statistic Family Survey Form – This form is often used by State and government agencies for a census program or to gather information from families in a specific area of the State. The statistics obtained from the census will be used for a decision-making procedure in various State government levels. In a multi-purpose statistics family survey form, the identity of the person who is interviewing the respondent will be recorded in the first page, while the second page contains a household grid to document the members of the respondent’s family. Other details to be stated in the form includes the personal data of the respondent, the limitations of the respondent’s personal independence, and the respondent’s marital status. 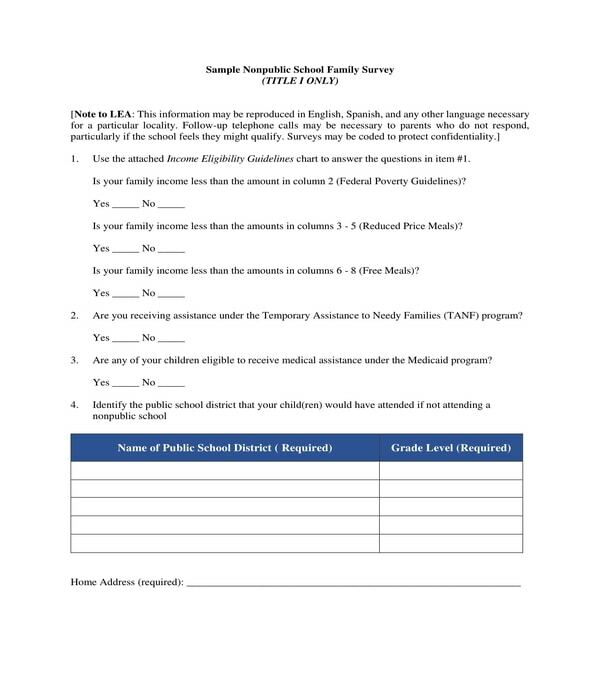 Nonpublic School Family Survey Form – Students who are in need of financial assistance are the target users of this form to determine their family’s income eligibility. Specifically, the form will require the respondent to disclose the average income of his family and list down the names of his family members who are still studying. Attached with the survey form is an income eligibility guidelines sheet which contains a table with the federal poverty guidelines, the amount and percentage of the reduced priced meal, and the free meal to be acquired by those who are eligible for the assistance. With the aforementioned form varieties, organizations will be able to choose which among the forms will cater their needs, preferences, and goals for conducting a family survey. However, regardless of the variety, a family survey form must not be given as a mandatory document to a respondent, rather it must be filled out by the respondent with his own free will. This ensures that the respondent will go through each portion of the form with his full understanding of the relevance of what he is doing, and why he is contributing to the survey.